Diamonds are available in nearly a dozen different shapes. The round diamond is considered to be the only traditional shape; everything else is a "fancy shape." Each diamond shape is distinct and they all have their own particular qualities which set them apart from one another. When shopping for fancy color diamonds, you will notice that they frequently come in fancy shapes. Fancy shapes, especially squarish ones, do a much better job of emphasizing the natural color of fancy color diamonds. A diamond's shape is the physical outline that forms the diamond. There are a preexisting number of diamond shapes available. Cut should never be confused with shape since shape has no bearing on the brilliance of a diamond and how well-cut it is. The most important factors in choosing a diamond stone is deciding on the shape that perfectly matches your style and looks beautiful on you. 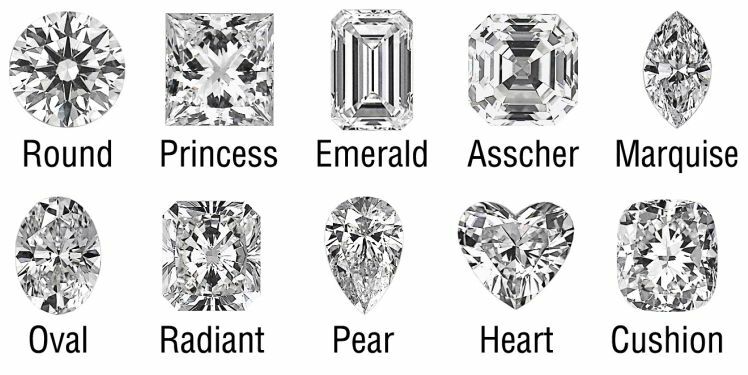 Your style may guide you to more traditional shapes such as the classic Round, Emerald or Asscher cuts or fancy shapes such as the Marquise, Heart or Pear. The classic and most popular shape is the Round Brilliant cut diamond. Its 57 facets bring out the most brilliance, fire and sparkle of all the shapes. The round brilliant cut is undoubtedly the crowd favorite and offers the most viable options when aiming for an optimum combination of cut, color and clarity grades, as well as brilliance and sparkle. While the round is the most popular shape for white diamonds, when it comes to fancy color diamonds, it is much less common. This is because the round cut does not maximize the depth and richness of color in fancy color diamonds. The best fancy color diamonds are usually found in fancy shapes, such as cushion and radiant, which do a fantastic job of accentuating their color. If you're looking for more contemporary style, consider the Princess cut, the second most popular shape. Princess cut diamonds are square or slightly rectangular in shape with pointed corners and an array of intricate facets that increase the diamond's inherent sparkle. The princess cut is frequently chosen for its abundance of brilliance and singular cut. Princess cuts are noted for their sharp corners and square shape. Dimensions may factor into your decision to go with one princess cut over another since this diamond shape can lean either rectangular or square. A length-to-width ratio of 1 to 1.05 will give you a princess cut that falls on the square side while length-to-width ratios above 1.10 will mean such diamonds are longer and, therefore, more rectangular. For a timeless, elegant look, consider the Emerald cut diamond with its long, lean lines. The rectangular cut, which has a relatively larger open table (top, flat surface) and fewer facets, highlights the clarity of the diamond more than any other shape. The emerald cut is known for its unique rectangular faceting, giving it a noticeably striking and clear appearance. Unlike other shapes, emerald cuts have a large transparent table that gives you an unobstructed view of their face. As with other square or rectangular diamond shapes, the emerald cut can be found in a range of lengths. You should refer to the length to width ratio of the particular emerald cut you are interested in to make sure it meets your requirements. A length to width ratio of 1.30 to 1.40 will result in the standard emerald cut shape. Anything significantly greater will mean an elongated emerald cut. This cut, also known as a step-cut, was intended strictly for emeralds and is now frequently employed for square and rectangular diamonds as well. The striking Asscher cut, often described as a square emerald, evokes an art deco feel from the 1920s and '30s. Created at the turn of the 20th century, this shape is now experiencing a resurgence in popularity. The Asscher Cut can be thought of as the emerald cut's fraternal twin - there are similarities in characteristics that tie the two together but enough of a physical difference exists to make them distinct cuts. Asscher cut diamonds are essentially square emerald cuts. Both cuts share the same type of pavilion, which consists of rectangular facets. The large transparent table gives you a clear view of the face. For a perfectly square Asscher cut, look for one with a length to width ratio of 1.00 to 1.05. The Radiant cut is relatively scarce and appeals to those seeking a unique look. This cut combines the geometrical lines of the emerald shape with the sparkling brilliance of the round cut. Its trimmed corners are the signature characteristic of this shape. The trademark feature of a radiant cut is its cut corners. It is a rectangular shape though its length is variable. Fancy color diamonds frequently appear as radiant cuts as this shape is excellent at accentuating depth of color. A length to width ratio of 1 to 1.05 means you will have a square radiant cut while a ratio over 1.10 will mean the radiant cut falls on the rectangular side of the spectrum. As with Asscher cut diamonds, the Cushion cut has been popular for more than a century. With a soft and romantic look, the Cushion cut (or "pillow cut" as it is often referred to as because of its rounded corners) has rounded corners and larger facets to increase the stone's brilliance. The cushion cut is a token of longevity. It has been the diamond cut of choice for many for over 100 years! The optimized brilliance in cushion cuts is the result of the enlarged size of their facets. Cushion cuts are a very popular shape in fancy color diamonds. The cushion cut is an excellent choice to maximize color and bring out its depth and richness. As with other quadrilateral diamonds, cushion cuts are available in square and rectangular options. A 1.00 to 1.05 length to width ratio means the cushion cut is square while a length to width ratio over 1.15 will mean the cushion cut is more rectangular. The Marquise cut diamond delivers drama with its brilliant cut and tapered points at two ends. This diamond, when worn as a ring, creates an elongated, slender look. Cleverly, it also maximizes carat weight, giving the appearance of a larger diamond than a round diamond of the same carat weight. If you're in the market for a stone that looks large, but isn't necessarily so in carat weight, then a marquise diamond may be just what you're looking for. This eye shaped diamond is a brilliant cut that flatters your fingers, lending them a long and thin appearance. If you want a classic marquise cut diamond, choose a length to width ratio of 1.75 to 2.25. The Pear cut diamond resembles a glistening teardrop that combines the soft, rounded end of an Oval shape with the sharp, tapered point of a Marquise cut. An interesting choice for the multi faceted personality. The pear shape diamond looks like its namesake, the pointy tipped, round bottomed fruit. This brilliant cut diamond is also sometimes referred to as a teardrop. Similar to marquise and oval cuts, longer pear shapes can make your fingers look effortlessly thin. Pear shapes are quite common among fancy color diamonds as it maximizes color magnificently. For a classic pear shape, pick a length to width ratio of 1.45 to 1.75. Oval cut diamonds appeal to those who like their classics with a little edge. Similarly to a classic round diamond, oval diamonds deliver a beautiful brilliance. The elongated shape adds an interesting twist to rings and accentuates the hand to create a slender look. The unique and alluring shape of the oval cut complements those with long and lean fingers, much like the marquise cut. The oval cut skillfully magnifies the richness of color in fancy color diamonds. A length to width ratio of 1.33 to 1.66 will give you the classic oval cut shape. The fancy shaped Heart cut diamond is for the confident woman who is all heart. While sometimes selected for engagement rings, it makes a beautiful choice for pendants in fancy colors such as yellow, pink or red. No diamond cut is more romantic than the heart shape. This is truly an unconventional but nonetheless gorgeous shape. If you want a classic heart shape, pick a length to width ratio between 0.90 and 1.10.